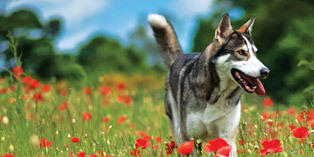 Whilst promoting Keep Britain Tidy and picking up litter along the way, Wayne and his Northern Inuit Koda (bred by Machine) have started and epic journey of walking the coast of Britain to raise money for both NIS Rescue and MIND. Two causes that are close to Wayne’s heart. Koda was originally Wayne’s father’s dog, which he had purchased from Koda’s original owner but sadly passed away just one week later. Wayne and his sister Maxine contacted the NIS Rescue to ask for help with Koda as they had never owned a dog, let alone a Northern Inuit before. With the help and support of NIS Rescue Wayne and Maxine decided to keep Koda rather than rehome him – and what fantastic owners they have turned out to be. Koda is no stranger to long walks with his owners and is loving his coastal walks around Britain. Wayne and Koda will walk 7000 miles round Britain’s coast this year and are picking up lots of local press coverage along with the way! Wayne an d Koda will be meeting up with people along the way so get in touch to find out where he’ll be next! Thank you Wayne and Koda!